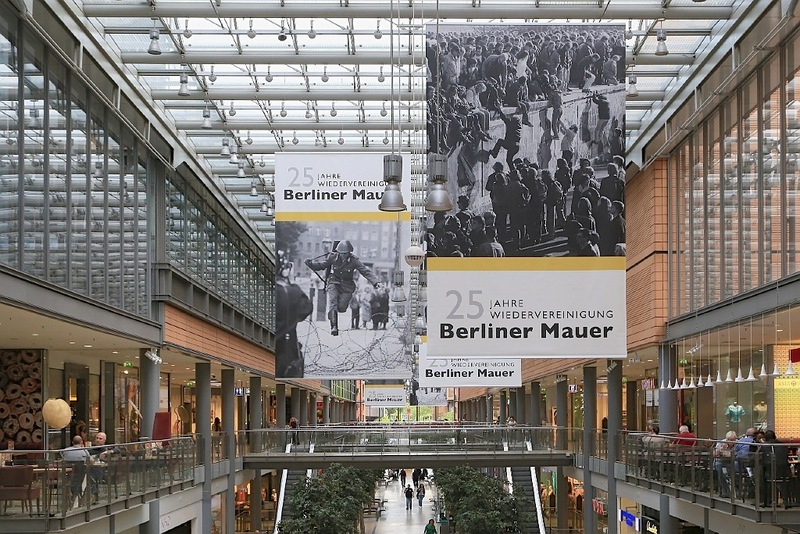 In the German capital city of Berlin, the large billboards street-level at Potsdamer Platz advertise the kind of photography one can make with Apple’s iPhone 6. The vertical pattern of dunes and stripes leading down to the fragment of the Berlin Wall and people walking across the line of sight lent themselves to a shot which came together over time. The Berlin Wall once made this spot and the entire area no-man’s land. • What are the walls in our minds? • What boundaries have we set for ourselves? • What consequences occur when limits are surpassed? 3 October 2015 marks the 25th anniversary of German Reunification. I made these photographs on 4 May 2015 with the Canon EOS6D camera and the EF 24-105 zoom-lens. This post appears on Fotoeins Fotopress at fotoeins.com at http://wp.me/p1BIdT-72u.